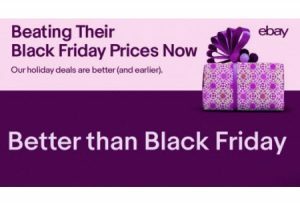 eBay launched “Better than Black Friday” deals today in which it promises to match or beat the deals advertised in retailers’ Black Friday circulars that have already been made public, but won’t be available until next week. Most items from third-party sellers are excluded from the promotion, which is held on its eBay Deals site, not the eBay Marketplace. eBay is rolling out “Better than Black Friday” deals November 12 and will make deals available through November 18.
eBay took the opportunity in its announcement to also promote its Best Price Guarantee (available only on its Deals site) and its “Fast, Free, Guaranteed Delivery” guarantee, which is available on more than 100 million listings. 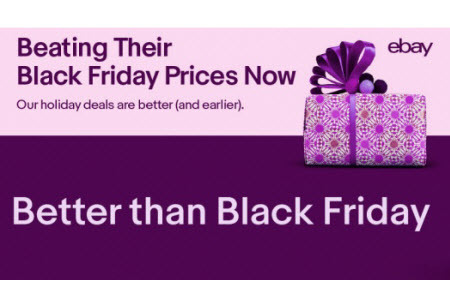 eBay is launching ‘Better than Black Friday’ deals today, granting holiday shoppers early access to Black Friday savings by beating (and matching) Black Friday Circular Deals ahead of the Thanksgiving weekend. Competitors include Target, Walmart, Macy’s, Kohl’s, JCPenney, BJ’s Wholesale and Costco. Beginning today, deals will be available until November 18, rolling out at 5 a.m. PT daily at ebay.com/BetterBlackFriday with free shipping, available while supplies last. The sale will include hot holiday gifts from jewelry, toys, electronics and kitchenware, featuring brands like Samsung, Ninja and Apple. You can find the deals on eBay.com/BetterBlackFriday.